The Rubicon River - River in northern Italy which was the boundary between two provinces within the Republic. The Roman Senate passed a law forbidding any Roman general from leading an army south of the river, which was considered an act of aggression against the city of Rome itself. The law wasn't put to the test until Julius Caesar's rise to power. In 49 B.C. 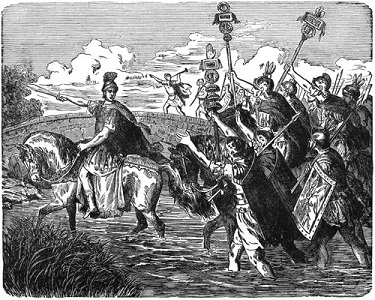 he crossed the river in violation of the law which led to a Roman Civil War and destroyed the Republic. It also led to the famous saying, "Crossing the Rubicon" which means passing a point of no return.